Vata characteristics are dryness, coolness, roughness, lightness and constant motion, and to restore balance to Vata dosha its good to include, smooth, heavy liquid foods with sweet, sour or salty tastes such as soups or dhals in your diet. Mung beans, split dhals, red or green lentils are all ideal vata foods, especially when flavoured with spices, cooked with chopped vegetables and eaten with basmati rice. Here is a basic dhal recipe. The three ayurvedic tastes that help balance Vata are sweet, sour and salty. Carrots, asparagus, tender leafy greens, beets, sweet potatoes and zucchini are the best vegetable choices. They become more digestible when chopped and cooked with Vata-pacifying spices. Vegetables can be combined with grains or legumes for satisfying one-dish meals. Basmati rice is also ideal for balancing Vata. Rinse the lentils in cold running water and place them in a medium saucepan with water, coconut, turmeric and salt. Bring to boil, reduce heat and simmer until the beans are soft but not broken down. Meanwhile, heat the oil or ghee to medium heat in a second saucepan. Add the hing and fry momentarily, then add the mustard seeds and fry over low heat for 2-3 minutes until they begin to splutter. Add curry leaves (be careful, if they are fresh leaves they will make a big splash) then after a moment the cumin seeds. Fry until the cumin seeds darken a shade. Add the ginger and chillies, turmeric, coriander, garam masala and salt, continue frying over low heat, stirring constantly. Add vegetables and a little water to prevent sticking and cover to simmer a few minutes until the vegetables are tender. Pour the spicy vegetable mixture into the lentils, mix well and continue to simmer for five minutes for the flavours to mingle. Serve the dhal with basmati rice – or add a little more water or vegetable stock and call it soup! Fig Choc Chip Cookies – Vegan & Gluten Free! Our Byron Yoga Retreat Centre is a tranquil eco haven within walking distance of Byron Bay's beautiful beaches and eclectic town centre. Offering affordable 3 day, 5 day and 8 day yoga and health programs, plus special interest retreats. Our Level 1 and Level 2 Yoga Alliance accredited courses are industry leaders. 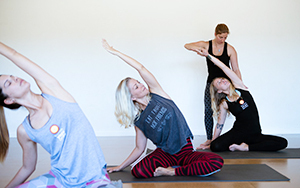 Our Certificate IV in Yoga Teaching 800 hour - 12 month course (2 days each week) represents one of the highest possible yoga teaching qualifications. As one of australia's longest running yoga centres, established in 1988, our studio is popular with locals and visitors to Byron Bay. 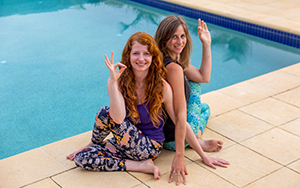 We also run classes at our Byron Yoga Retreat Centre and regular workshops around Australia.